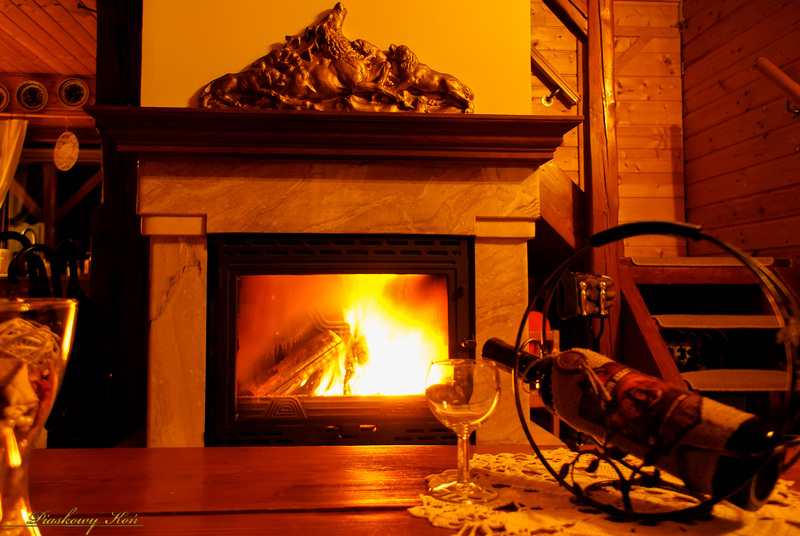 All season self-catering wooden cottage, sleeps 6 - 8 people, with fireplace, outside swimming pool and large porch area - large Poland’s Lower Silesia - Karkonosze mountains. 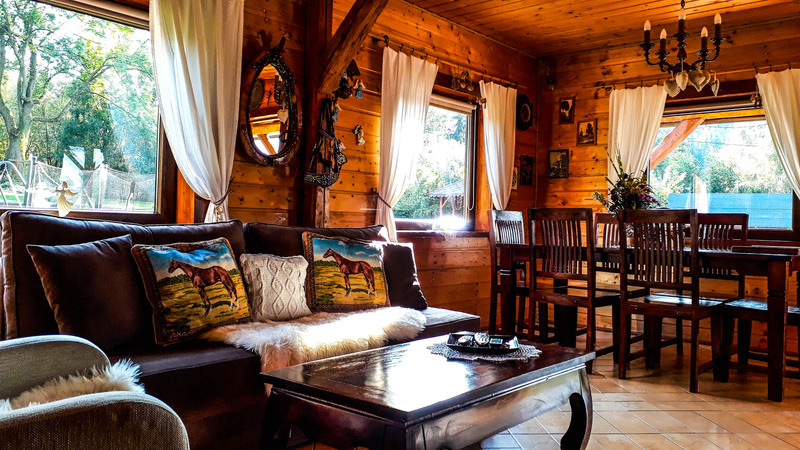 This rustic cottage has a lot of space to comfortably spend time during the day, including a large living room with fireplace, a covered terrace with great panoramic view of the mountains and at night with two cozy bedrooms. Total living space is 80 square meters. It is surrounded by meadows, forests, and hills and features many beautiful views. The whole cottage and its infrastructure are at your exclusive use. There are no shared space with the house "Nol" (about 100 m away), such as swimming pool, barbecue, playground, fireplace, access road, parking. This Sandy Horse "Bakalia" cottage is situated on an extensive one-hectare parcel of land with small fish ponds and a mountain stream. There is also patio furniture (a table, chairs and sun loungers). We hope your time spent in the cosy living room with a burning fireplace will be relaxing and memorable. There is also a big dining table and a child’s high chair available for use. There are two bedrooms located on the second floor of the house. In each bedroom there is a double bed and a single bed. Each one can sleep three people. Each bed has a nightstand with a lamp. In addition, each room has a chest of drawers to store your clothing. The bedrooms are equipped with sets of bed linens and towels (bath and hand). If needed, an additional double sofa to be set up in living room. There are two bathrooms available - located on ground and second floor. Bathrooms are very comfortable. They are equipped with a sink, toilet, shower and basic hygiene measures (liquid soap, toilet paper and a hairdryer). On the ground floor, the kitchen is equipped with everything you need for convenient food preparation, including a complete set of tableware (plates, cups, cutlery, etc. ), a set of pots for cooking on an induction stove, dishwasher, an electric kettle, a coffee machine, toaster, microwave oven and fridge. For more information - see 'amenities' tab. There is an outdoor swimming pool next to a wooden cottage available (usually form may to october) - 4,6 m in diameter with a depth of 1.2 m.
Also there are sun loungers and hammock. Relaxing by the pool you can enjoy the mountain landscape. The swimming pool is available with exclusive access for guests of the "Nol" cottage. In addition, you can use a brick barbecue and a place for a bonfire. There is free Wi-Fi Internet Access. Parking is next to house. The area surrounding the mountain cottage is unfenced, which allows freely migration of roe deer and deer. We do not accept pets in a cottage "Bakalia"
- pots, cutlery, plates, bowls, cups, glasses, cups, glasses, cutting boards, etc. There are no extra charges for electricity, water, etc. The hotel day (accommodation) in Sandy Horse starts at 16:00 and ends at 11:00 on the day of departure. Arrivals before 16:00 must be agreed in advance, otherwise no prior accommodation will be possible. In the Sandy Horse cottages "Nol" and "Bakalia" smoking is not allowed, as well as using of any equipment powered by electricity or gas, which is not a regular equipment, which may create a fire hazard, in particular electric heaters, irons, gas burners, candles.